Document contains invalid fonts. Read here for information about how to resolve this issue. The message is telling you that the entire submission is likely to be Failed by eFileTexas if you submit the document as is. Unfortunately, eFileTexas provides no absolute guarantee that this is the case so you are effectively gambling if you submit the filings as is. First we will tell you how to resolve the issue and then, if you are interested, you can read further and how to diagnose the problem yourself. If your PDF already contains the invalid fonts prior to uploading it to FileTime, FileTime is able to detect those fonts but not remove them from the file. To the best of our knowledge, we have only seen invalid fonts in scanned PDF files that have been run through an OCR process prior to uploading to FileTime. The fastest way we know of to resolve the issue is to upload your scanned PDF file directly to FileTime without running it through your OCR software. FileTime's document converter will make the PDF file text-searchable without inserting the invalid fonts into the document. Remember that the FileTime document converter feature is only available on one of our pay-per-submission eFiling plans so if you are on a paid plan you will need to upgrade to a paid plan to have access to this feature. Our experience is that this issue generally arises when you scan and OCR a document containing check boxes. When your OCR software encounters a characters on the page such as check boxes and asterisks, it sometimes uses font-type such as Zapfdingbats and Symbols. While there may be other troublesome font-types we know with certainty that these two font-types are troublesome for eFileTexas. Open the offending document in a PDF viewing product such as Adobe Acrobat. In this case, you can use the free Adobe Reader program. Click the File button in the extreme upper left corner of the program as shown in the above screen shot. Click Properties on the drop-down menu. That opens the Document Properties window (below). Click the Fonts tab on this window to display the fonts utilized in the document. 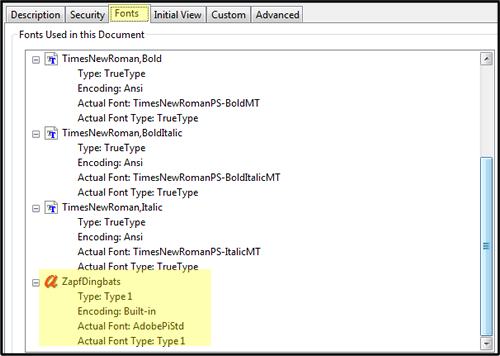 There may be other font-types that eFileTexas rejects but when you see Zapfdingbats in the file as in this example you know the filing containing this document will be Failed by eFileTexas. The FileTime document converter suite does not add "illegal" fonts such as this when it converts your PDF to a text-searchable PDF file. On a related note, filings are often failed because the document contains security restrictions. Here is how to check for those issues. 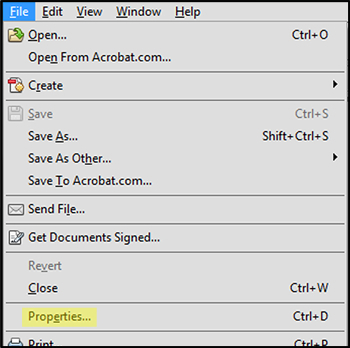 Open the document, Click File and then click Properties to open the Document Properties window for the document. Click the Fonts tab this time as shown in the image below. 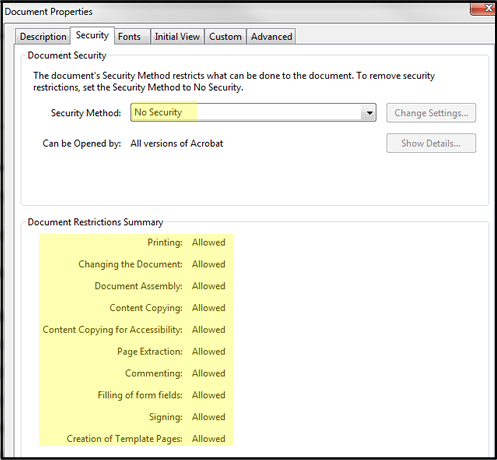 eFileTexas does not allow any security features to be enabled in a document. So if security is enabled and any of the options under the Document Restrictions Summary are disallowed to you need to fix those issues before uploading your document.